When it comes to weight loss, the first step is deciding that it's time to make a lasting change. Once you have committed yourself to leading a healthier lifestyle, it's time to talk with your doctor for advice about your weight loss options. One increasingly popular option is weight loss surgery. 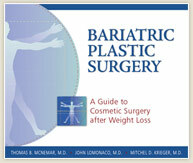 The doctors who perform weight loss procedures are known as bariatric surgeons. While there are dozens of bariatric surgeons in Northern California, Dr. McNemar partners with 3 trusted surgeons who serve patients from the Bay Area and California's Central Valley. He works closely with these surgeons to develop a post weight loss surgical plan and timetable so that patients can achieve their desired look and feel great about their results. Dr. McNemar is proud to partner with these surgeons and help men and women throughout Northern California achieve their personal transformations through plastic surgery. For more information on how you can get started and learn more about all your weight loss options, contact Dr. McNemar online or call (925) 866-0177 for our San Ramon office or (209) 834-0626 for our Tracy office.